Today we celebrate the life of Rebecca Lee Crumpler (1831-1895). She is best remembered as the first African-American woman physician in the United States. Born Rebecca Davis in Delaware on February 8, 1831, she grew up in Pennsylvania, where her aunt provided care for the ill.
A bright girl, Rebecca attended a prestigious private school, the West-Newton English and Classical School in Massachusetts, as a “special student.” In 1852, she moved to Charlestown, Massachusetts, and worked as a nurse. In 1860, she took the bold step of applying to medical school and was accepted into the New England Female Medical College. Fortunately, Drs. Talbot and Gregory ignored such false claims and organized a school that required “a good English education,” a “thesis on some medical subject,” and a set of courses on the theory and practice of medicine, materia medica, chemistry and therapeutics, anatomy, medical jurisprudence, obstetrics and diseases of women and children, and physiology and hygiene. The coursework was 17 weeks in length (30 or more hours per week) during the first year of instruction. Following this was a two-year preceptorship, or apprenticeship, under an established physician’s supervision. 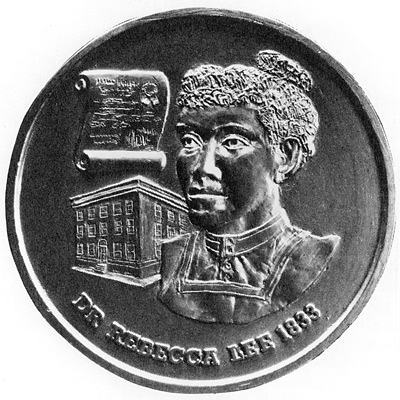 In 1864, Rebecca became the New England Female Medical College’s only African-American graduate (the school closed its doors in 1873.) A few statistics help put her remarkable achievement in perspective. In 1860, there were only 300 women out of 54,543 physicians in the United States and none of them were African-American. Some historians have wondered if Rebecca even knew of her status as “the first” given that for many decades in the 20th century that credit was awarded to Dr. Rebecca Cole, an African-American woman who received her medical degree from the Woman’s Medical College of Pennsylvania in 1867. The first “historically black” medical school in the U.S., the Howard University College of Medicine, would not open until 1868. As late as 1920, there were only 65 African-American women doctors in the United States. Around the time of her graduation, Rebecca married for the second time. (Her first marriage to Wyatt Lee, from 1852 to 1863, ended with his death in 1863.) In 1864, she married Arthur Crumpler. Rebecca began a medical practice in Boston. 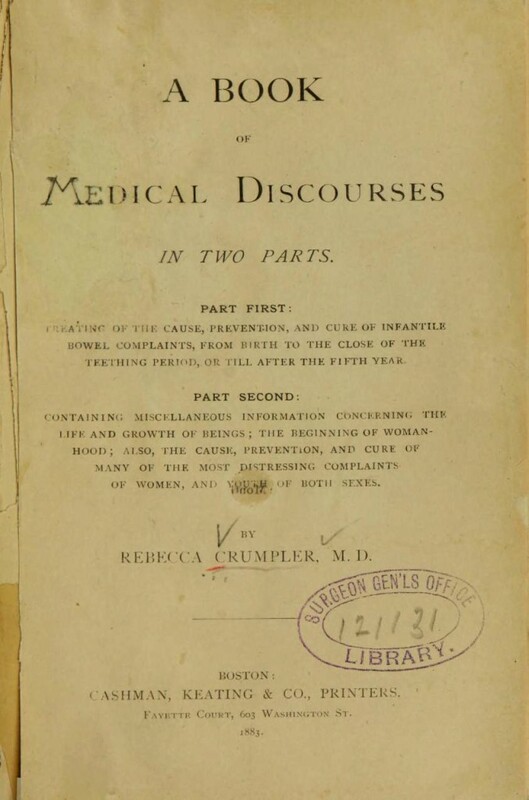 Crumpler’s text, “A Book of Medical Discourses in Two Parts,” was published in 1883. In 1869, the Crumplers returned to Boston and they settled in a predominantly African-American neighborhood on Beacon Hill. She practiced medicine there, as well. In 1880, she and her husband moved, once again, this time to Hyde Park, New York. Although there exists little evidence that she practiced much medicine after this point, she did write a fine book, “A Book of Medical Discourses in Two Parts,” which was published by Cashman, Keating and Co., of Boston, in 1883. Rebecca Davis Lee Crumpler died on March 9, 1895, in Hyde Park. On this anniversary of her death, let us applaud her courage, perseverance and pioneering achievements. She is an inspiration to all who face adversity, seek diversity, and forge the path forward. Her passion “to mitigate the afflictions of the human race” was Rebecca’s gift and historic legacy. Editor’s note: The headline has been updated to reflect that Crumpler was the first African-American woman physician, not African-American physician. It has also been updated to correct Arthur Crumpler’s occupation; he was not a physician.